When you're looking to get started on ice climbing and practice is your game, it's hard to go wrong with the IceHoldz Introductory Ice Wall Package. 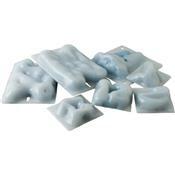 Made with IceHoldz's proprietary composite plastic shell and glacier glue, these molded pieces simulate the penetration of real water ice, so you can hone your glacial wizardry even in the basement. Rotate these bolt-on and screw-on holds 90 degrees for a fresh face, and send in the shells to be recycled when you're ready to buy replacements.